Posted April 12th, 2019 by West and Hill & filed under General News, Staff Members. West & Hill believe continuous education, development and training is important in the construction industry. We are a relatively small company, with seven full-time staff members. Our aim is to get our team as qualified and experienced as possible in their trade whilst developing new skills and techniques. Enabling us to operate and provide a knowledgeable in-house team to complete your project. Established in 1992, NPORS is now one of the UK’s leading Accreditation and Registration Bodies, working across the Construction, Industrial, Utilities, Warehousing and Distribution, Agricultural, Ports and Marine sectors. The course teaches how to operate the excavator safely. It also teaches health and safety and understanding the of the machines. 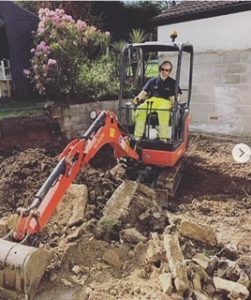 Our Director/Project Manager Danny is NPORS excavator trained and his skills were put to good use on our current project this week. 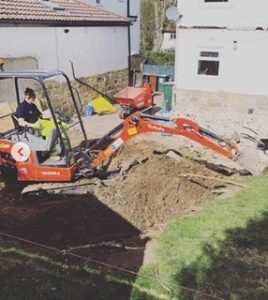 Danny digging the ground ready for our extension project in North Leeds.